Anchoring off the shore is the basic at Yoshida. There is a pier for tender boats. your sail boat should not approach there because of its shallow water depth. Away from the pontoon, your sail boat should ride at anchor. 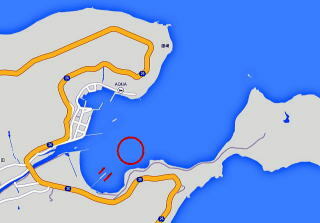 See the red circle in the map below. Then, go to the pier with a tender boat. and my red-colored boat at anchor off the pier where the depth is enough. 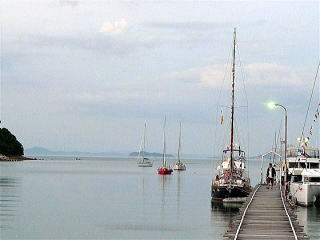 In front of the pier, there is a restaurant of Sea Tiger Island Inn with showers and toilets. Yoshida is a wonderful anchoring spot.